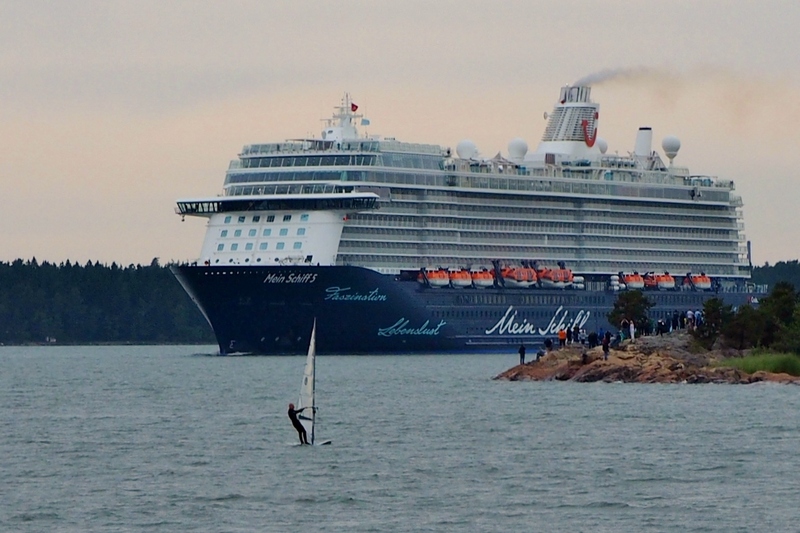 Foreign readers may not be aware that my present hometown Turku boasts a long traditions in shipbuilding. 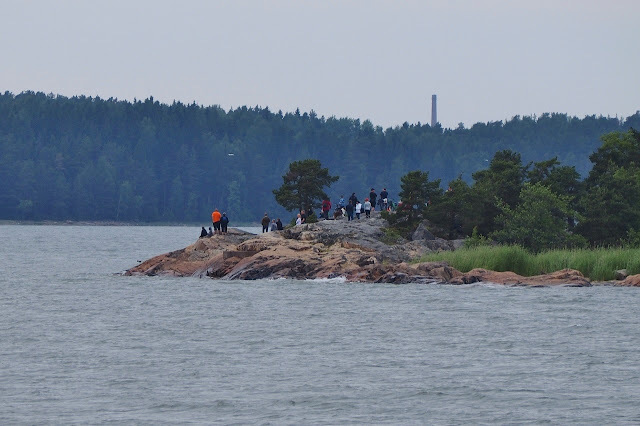 There has been a shipyard here since the early 18th century, not to mention the sailing ships that were built here starting from at least the 16th century. 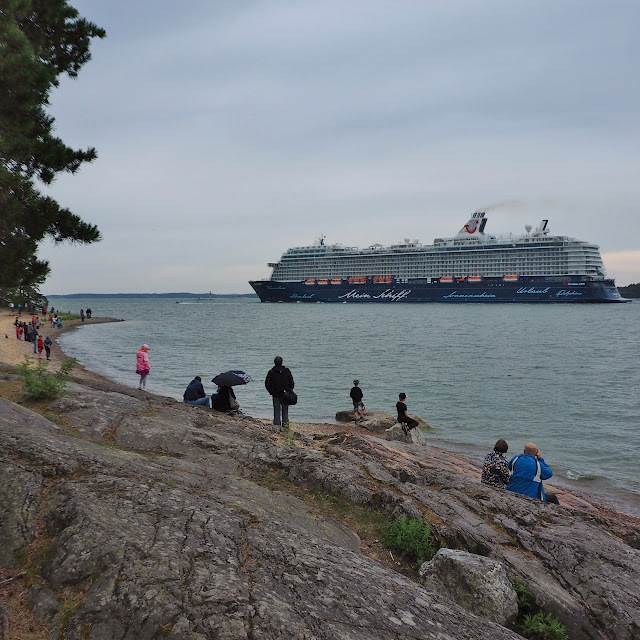 Hubby made his whole career in marine industry and even I had a job inside the gates of the Rauma shipyard for several years in my late 20s and early 30s – that’s where we met about two decades before we started dating. 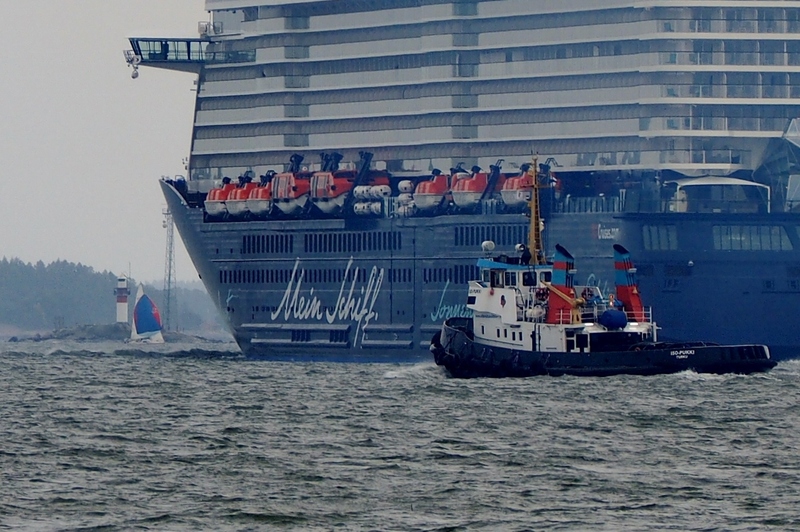 With such a background, it is not surprising we headed to the shore to watch a newbuild leaving its birthplace towards a busy life at sea. 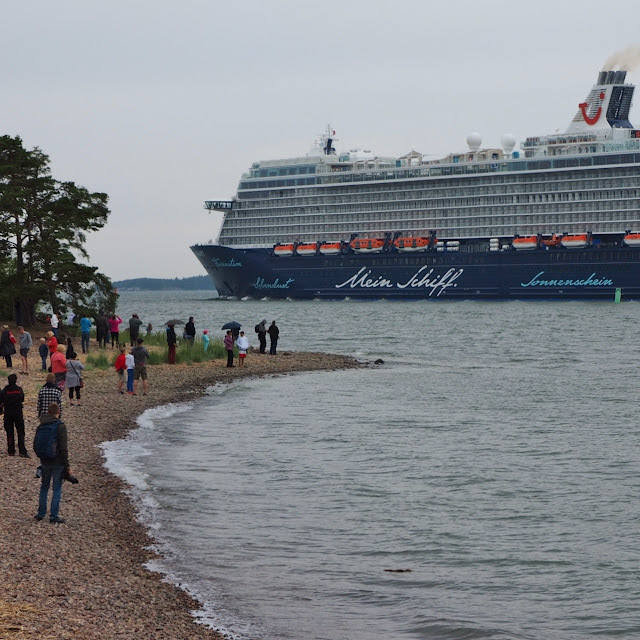 On June 20, the cruise ship Mein Schiff 5 built at the Meyer Turku shipyard was handed over to TUI Cruises which is a joint venture of the German tourist company TUI AG and the American Royal Caribbean Cruises Ltd. 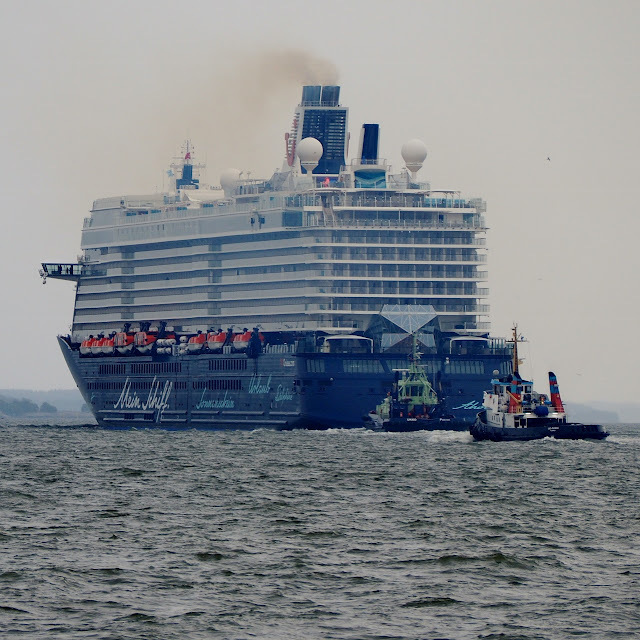 The next day the ship headed for Kiel from where it will serve the German-speaking luxury cruise guests sailing in Northern Europe and the Mediterranean in the summer season and in the Caribbean during winter. 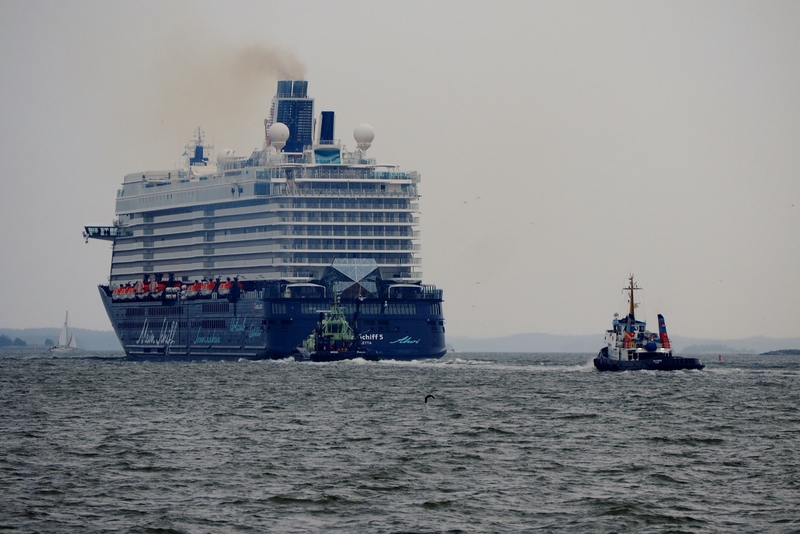 Between delivery and now, the vessel has made a few short ‘pre-cruises’ in the Baltics. The christening ceremony will be held as a public event in Travemünde, the ferry port of Lübeck, tonight. 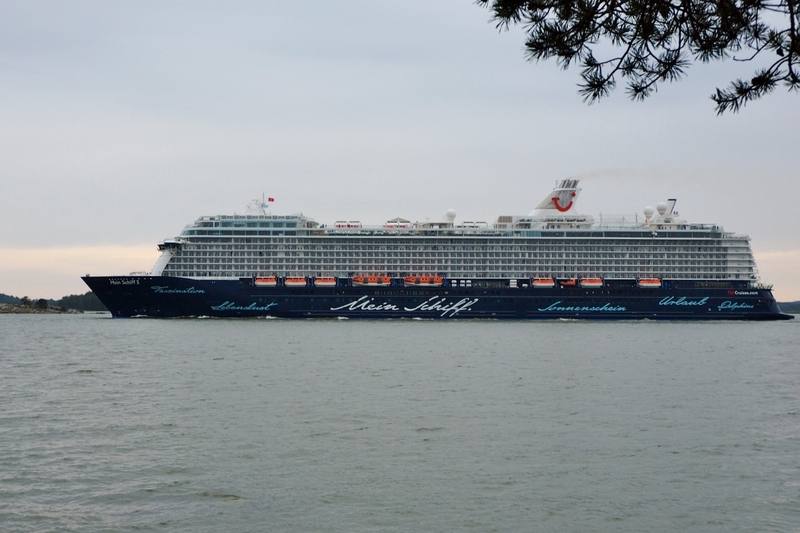 The maiden voyage starting tomorrow from Kiel will stop at Tallinn, St. Petersburg, Helsinki and Stockholm. The ship measures 295m x 35.8m and has 15 decks. It can accommodate 2794 passengers into its 1267 cabins almost 1000 of which have a balcony. A crew of more than 1000 people will work tirelessly to fulfil the wishes of the guests according to the all-inclusive feel-good philosophy of TUI Cruises. Restaurants, bars, shops, fitness facilities, beauty salon, spa, outdoor swimming pool, jogging track, you name it. 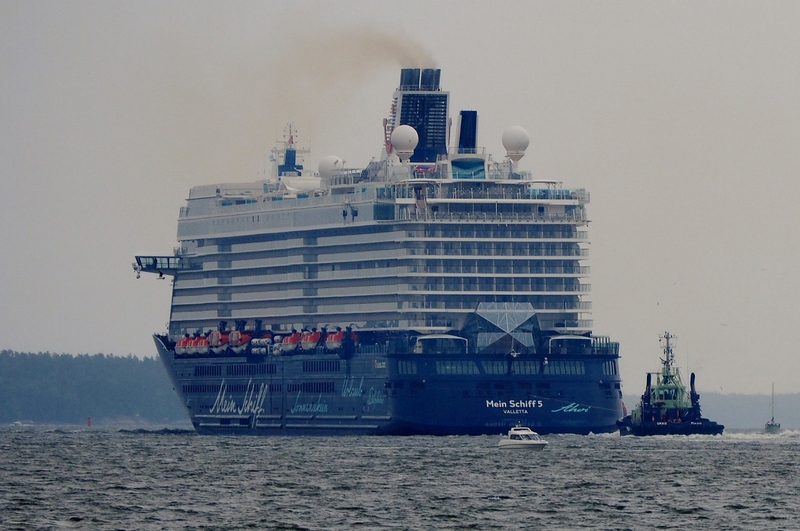 I don’t think this is the kind of travel I would ever want to take part in for more reasons than one but it is good to know the newbuilds incorporate eco-friendly technologies minimising both emissions and energy consumption. Fascination, zest for life, sunshine, holiday, harmony, peacefulness, wellbeing, inspiration are some of the words painted on the sides of the vessel. I am sure the Turku shipbuilders also recognise many of these points feeling happy about their current masters. 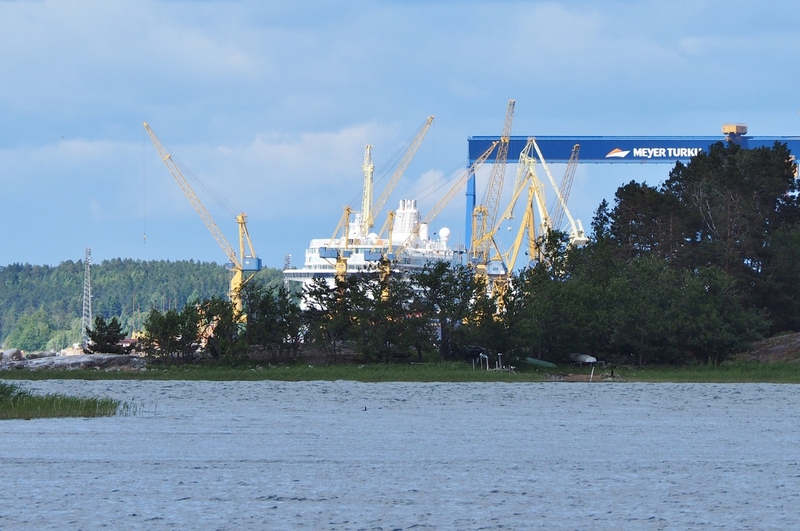 After a few turbulent decades with financial problems and several unsuccessful mergers and acquisitions, the German family-owned Meyer Werft that bought the shipyard a couple of years ago was the best possible saviour you could have wished for to safeguard the future of shipbuilding in Turku, says hubby who knows. As the order book is secured until 2020 we will have many more opportunities to watch brand-new cruise ships gliding by the Ruissalo island towards the open sea. 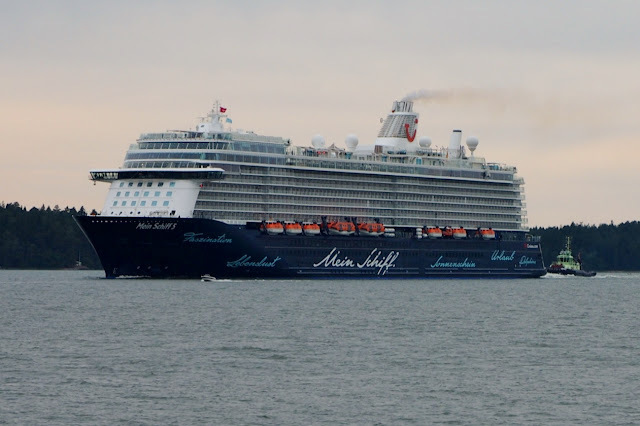 Too bad the weather was this gloomy, just like today, but let's hope we'll see some blue sky when Mein Schiff 6 and 7 are leaving. They really are enormous aren't they! Lots of people are going to be enjoying themselves! 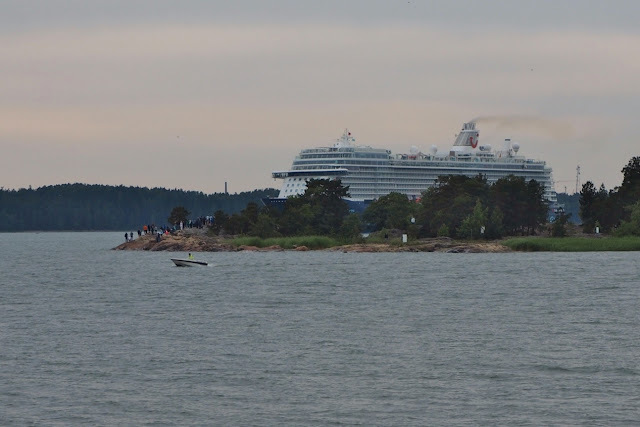 A cruise will be quite an experience I am sure although not one for me. What a sight! They are enormous. 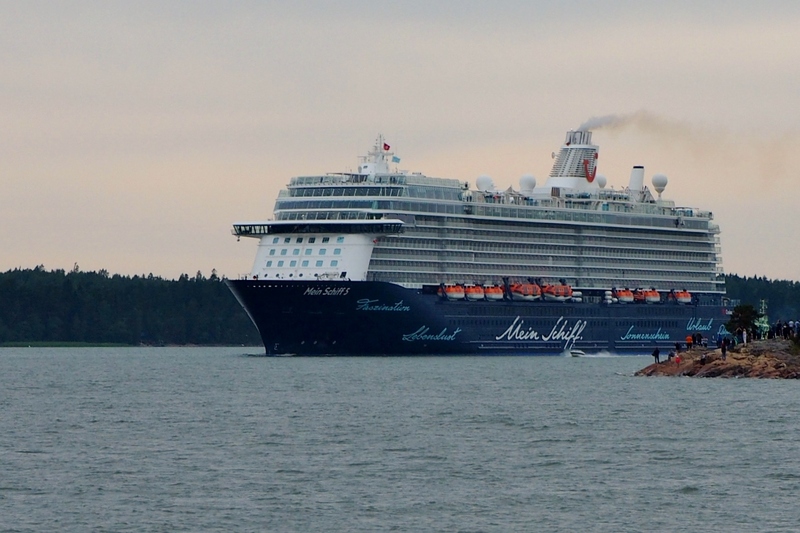 Like a huge hotel floating on sea with all amenities you could possibly wish for. Wow! It's humbling when you see something of that size, isn't it? We see pictures of boats and ships, but up until you see one up close you can't really visualize the enormity of their size. Makes my little bass boat feel like I'm playing with a toy boat in my bath tub. Do you think my wife would mind if I buy a bigger boat?